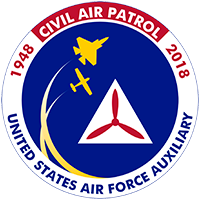 Father Jan Dolny, a Roman Catholic priest from the Central Virginia Catholic Cluster, sprinkles holy water on one of the many Civil Air Patrol aircraft on the ramp at the Middle East Region’s Search-and-Rescue College in Blackstone, Virginia. 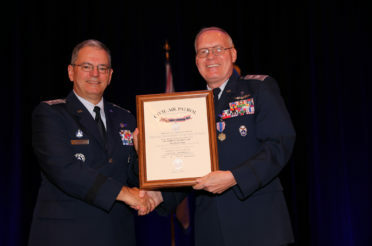 Beside him is Chaplain, Lt. Col. Timothy Miner, acting Wing Chaplain of the Virginia Wing and organizer of the CAP’s first “Blessing of the Fleet” ceremony. 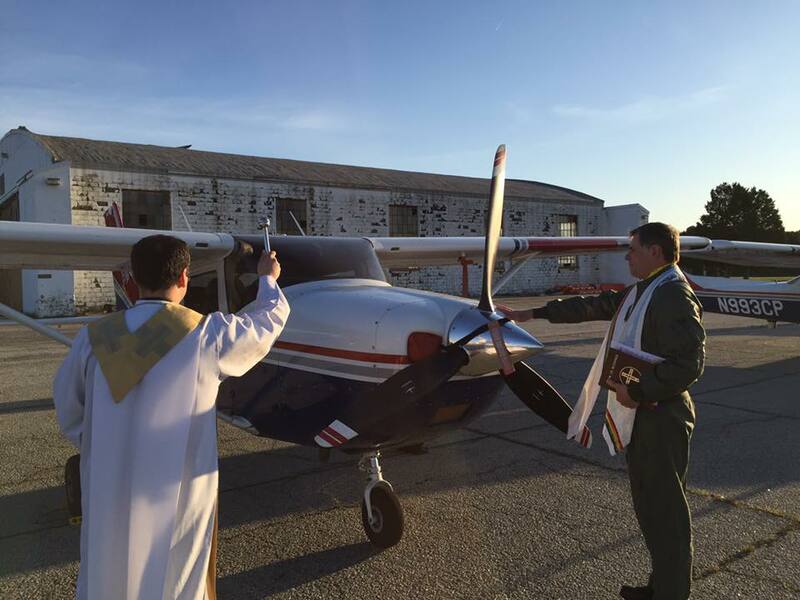 As the sun rose over Allen C. Perkinson Airport/Blackstone Army Airfield in Blackstone, VA, on Sunday, 24 April 2016, members of the Civil Air Patrol Chaplain Corps from the Middle East Region joined with local clergy to perform the first “Blessing of the Fleet” ceremony for over twenty aircraft and additional ground vehicles used in search-and-rescue operations in states from Delaware to South Carolina. Colonel John Knowles, the CAP commander of the Middle East Region hosted the ceremony as part of the annual MER Search-and-Rescue College, MERSAR 2016. 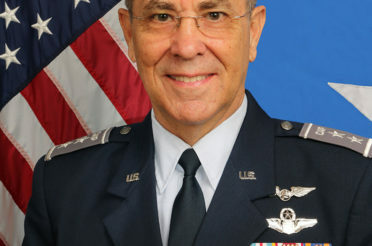 The acting wing chaplain from the Virginia Wing, Chaplain, Lt. Col. Timothy Miner, organized and officiated this first event. Assisting during the ceremony were Chaplain, Lt. Col. Wayne Byerly, wing chaplain from North Carolina; Chaplain, Lt. Col. Mike Strickland, wing chaplain from the National Capital Wing; and Father Jan Dolny, a Roman Catholic priest from the Central Virginia Catholic Cluster which ministers to the community of Blackstone. 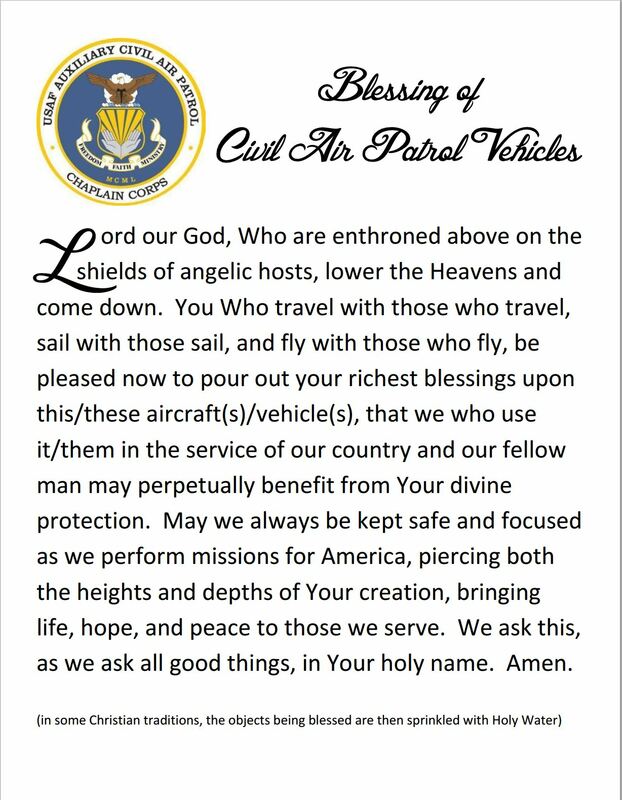 The official prayer used to bless the vehicles (shown below) came from Chaplain, Lt. Col. John Reutemann, a former Spaatz cadet from the region who is also a Roman Catholic chaplain on active duty with the United States Air Force and, therefore, was unable to attend. Colonel John Knowles, second from the left, commander of the Middle East Region, hosts the first “Blessing of the Fleet” ceremony for the aircraft and corporate vans attending the MER Search-and-Rescue College on Sunday, 24 April 2016 at Fort Pickett Army National Guard Base in Blackstone, Virginia. 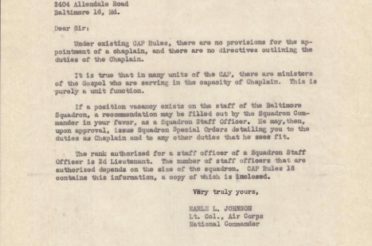 With him are three wing chaplains and a local Roman Catholic priest. 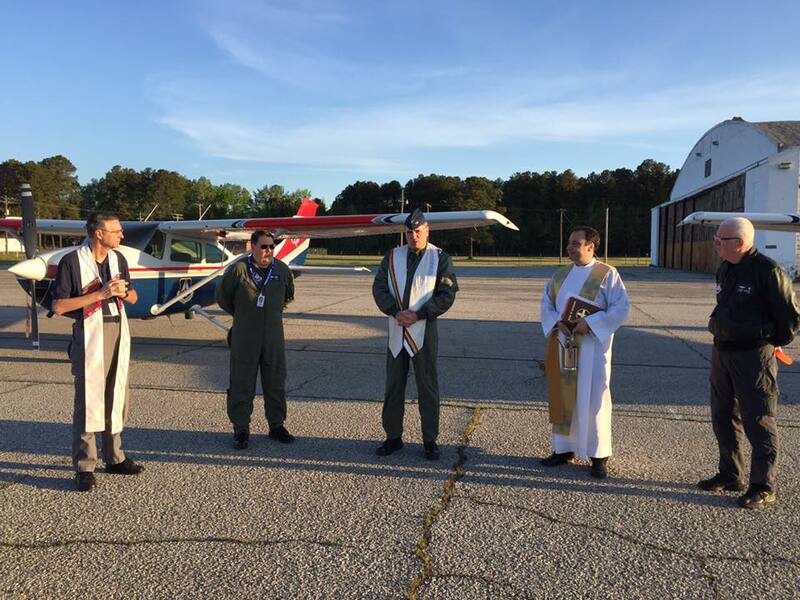 The clergy are, from left to right, Chaplain, Lt. Col. Wayne Byerly, Wing Chaplain of the North Carolina Wing; Chaplain, Lt. Col. Timothy Miner, acting Wing Chaplain of the Virginia Wing and organizer of the ceremony; Father Jan Dolny, a priest from the Central Virginia Catholic Cluster; and, Chaplain, Lt. Col. Mike Strickland, Wing Chaplain of the National Capital Wing. 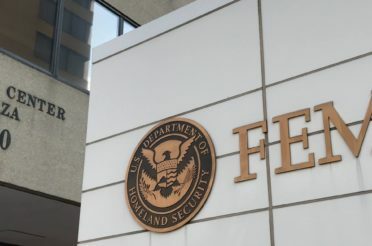 The “Blessing of the Fleet” ceremony is new to the CAP, but not new to the United States. There are official ceremonies in fishing fleets around the eastern coast that date back hundreds of years. It was a surprise encounter with such a ceremony in Occoquan, Virginia, by Chaplain Miner that inspired this effort. The United States Navy has conducted such a ceremony for as long as there has been and navy and even before. This year’s Navy event took place in Washington, DC, just the weekend prior. 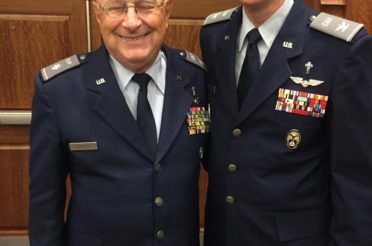 During his recent tour to Southwest Asia, Chaplain Reutemann had a very active ministry blessing the equipment used by the servicemen and women doing their work. 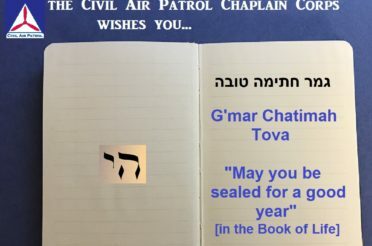 “I blessed all sorts of things, even an RPA (remotely-piloted aircraft)!” he shared on social media with his fellow chaplains in CAP. 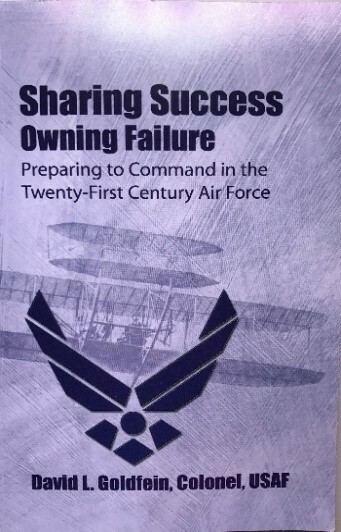 As part of his introduction, Miner stated that the prayers and blessings at the fleet ceremony are reflections of the daily efforts of CAP chaplains to ask for divine intervention for safety, wisdom and mission-success as the CAP pilots, drivers, passengers and crew members serve their communities and country during their volunteer service. As part of his welcoming comments for the ceremony, Col. Knowles, who volunteers in his own parish church in Maryland, acknowledged the work of the CAP clergy and character development instructors in fostering spiritual fitness and character development. 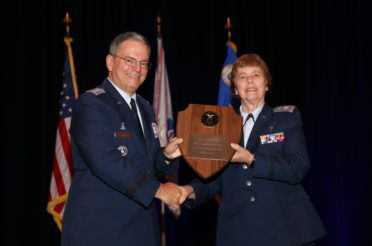 He said, “The work of our chaplains is vital to our people and our missions.” Knowles calls this year’s ceremony a “new tradition” at the annual MERSAR where hundreds of CAP cadets and senior members from all seven wings in Middle East Region along with members from across the Southeast US, hone their skills and prepare to serve during volunteer emergency-service missions in the air and on the ground in their community, around their state, and in the region. Chaplain, Lt. Col. (Father) John Reutemann, CAP, a Spaatz cadet from Maryland and the current Wing Chaplain for Montana wrote this Christian blessing for the first “Blessing of the Fleet” ceremony done in the Civil Air Patrol.